Last week, along with the well received GTX 750 Ti (and GTX 750), Nvidia quietly launched the GTX Titan Black into retail channels. It hasn't sampled it to media outlets, but Zotac has kindly furnished us with a sample so we can see what it can do. 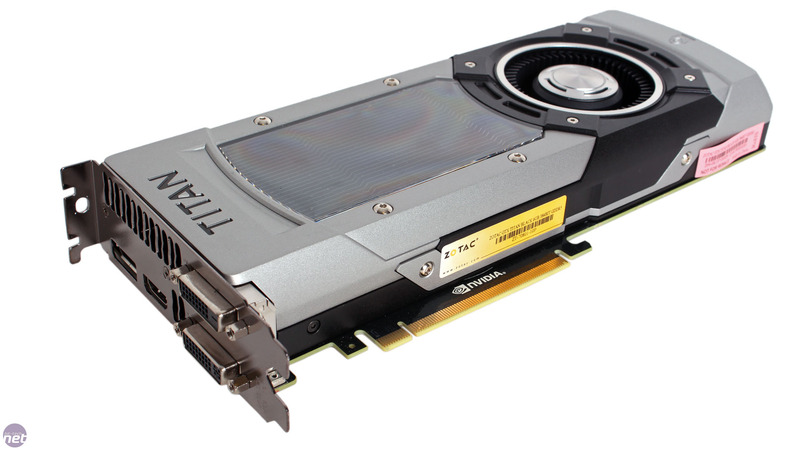 While the launch of the original Titan was heavily covered and a fine example of how to wave willies, Titan Black's performance gains are going to be minimal compared to the GTX 780 Ti in games, hence the fuss-free launch. The original Titan, which this card outright replaces, is, after all, less of a gaming product than it is an entry level professional compute one – apparently only around half of those sold were ever used to play games at all. So, what exactly is the point of GTX Titan Black? 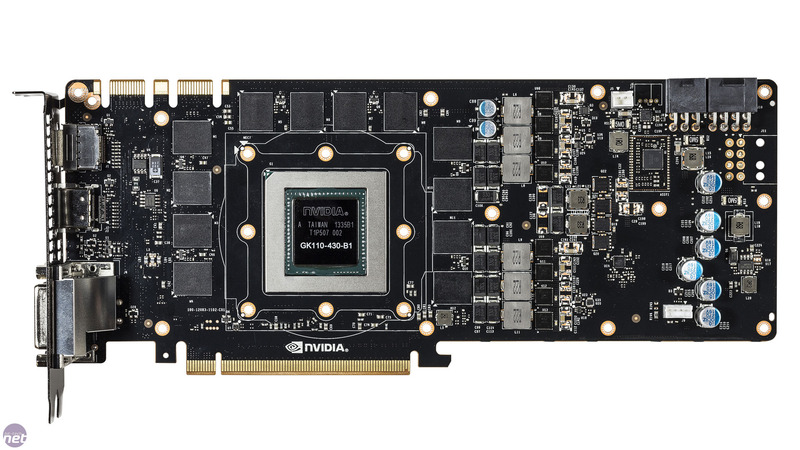 Essentially, it's just to ensure that the top card in Nvidia's GeForce product stack is technically the best one available for both gaming and GPGPU workloads. Previously, it was the GTX 780 Ti for one and GTX Titan for the other, which was something of an oddity given the massive price tag of the latter card (which the GTX Titan Black will sell for too). That's not to say that GTX Titan Black will suddenly become an attractive card on the price-performance scale, however. To achieve this, as you can see in the specs table below, GTX Titan Black combines the best parts of the GTX Titan and the GTX 780 Ti to produce the ultimate GK110 product. 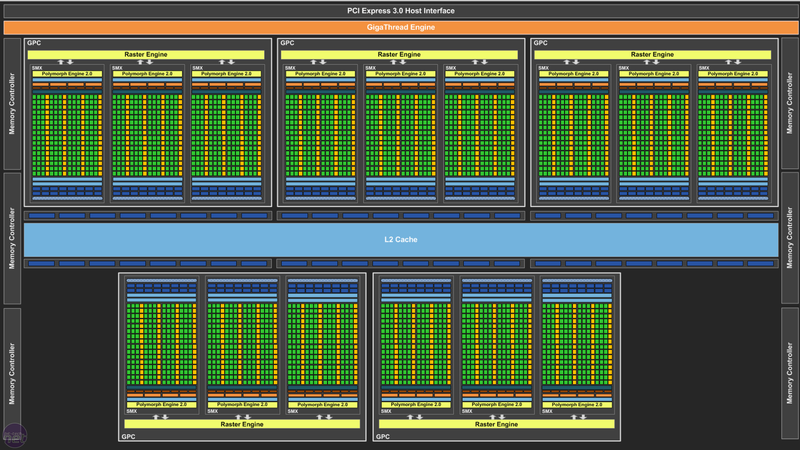 Like the GTX 780 Ti, its 15 SMXs are all fully enabled, giving it 2,880 CUDA cores and 240 texture units over GTX Titan's 2,688 and 224. It also borrows the GTX 780 Ti's memory frequency of 1.75GHz (7GHz effective) for a 16.7 percent increase in memory frequency and bandwidth over GTX Titan. GTX Titan Black also carries over the elements of GTX Titan's design that give it the edge in compute tasks. 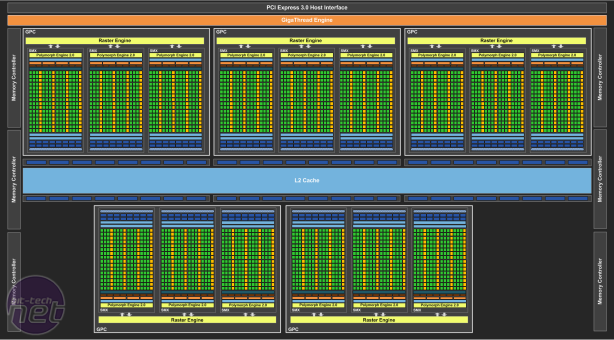 As such, it has a full 6GB of GDDR5, double that of the GTX 780 Ti, as well as uncapped double precision performance – in non-Titan GK110 products, Nvidia's drivers artificially limit the performance of the FP64 CUDA cores to 1/8 of their potential as a way of distinguishing the product lines and marking Titan out as the main GeForce compute card by default. The final piece of the puzzle is a clock speed bump. The base clock is up from 875MHz in GTX 780 Ti to 889MHz here, making it the fastest reference GK110 product available. It has an extended boost curve as well, as the boost clock is listed at 980MHz compared to 928MHz on the GTX 780 Ti – our Titan Black constantly hit 1,058MHz in real workloads, so it's not afraid to get its Boost on. Ultimately, this is what will net it a small advantage over the GTX 780 Ti in games, as the extra VRAM is unlikely to do much while FP64 performance is irrelevant. Compute performance gains over GTX Titan will be more tangible, however. We were disappointed to learn that the card hasn't been given a makeover to match its name - the “Black” in the product name had us hoping for a black anodised version, which we think would look phenomenal (though it's still a great looking card). The heatsink and “Titan” engraving on the card are black now, but that's about it. As with GTX Titan, Nvidia does not permit its board partners to ship custom cooling configurations for GTX Titan Black. 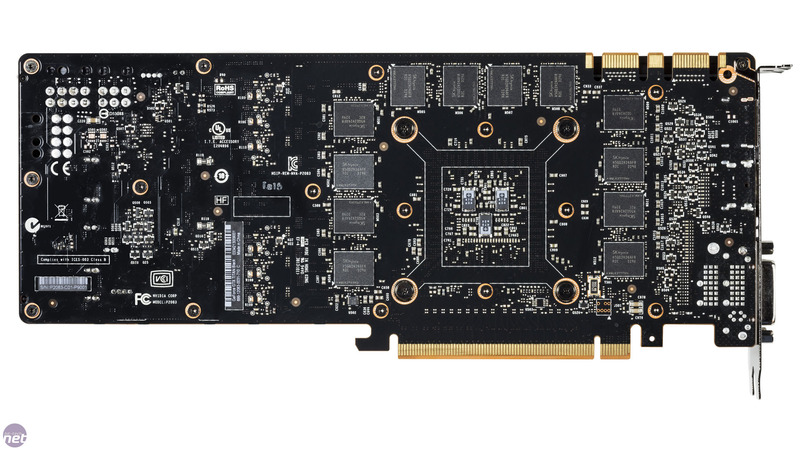 GTX Titan Black uses the familiar 267mm GK110 PCB. It has a 6-pin/8-pin PCI-E power connection combination, dual SLI connections and the standard selection of video outputs: dual-link DVI-I, dual-link DVI-D, HDMI, DisplayPort (so G-Sync is supported). A metal contact plate cools the twelve front SK Hynix memory chips as well as the 6+2 phase power VRMs, while a vapour chamber and heatsink tame the GPU. A single radial fan provides airflow, and the closed design means heat is essentially all exhausted out of the rear I/O panel. The additional twelve memory modules on the rear of the PCB are left uncooled. While there will be no design variation between board partners, bundles are likely to vary. For its part, Zotac supplies its Splinter Cell games bundle (including Double Agent, Conviction and Blacklist), as well as a DVI to VGA adaptor and a few power cable adaptors. It's nothing special but doesn't feel like it's lacking anything either. While we'll be running the GTX Titan Black through our benchmarks, this isn't much of a review in the traditional sense. 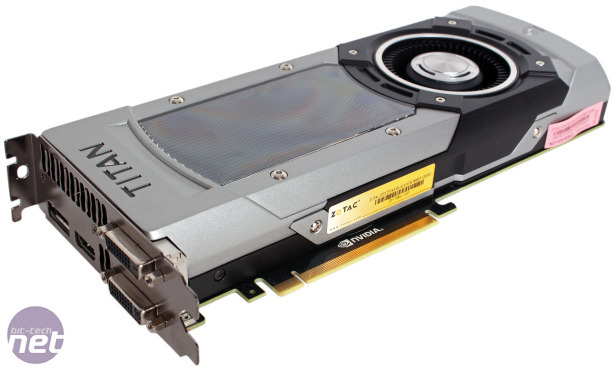 At £785, we can already tell you that the GTX Titan Black is, like its predecessor, poor value from a gaming standpoint, and that the GTX 780 Ti will match its performance after a minute of overclocking. Nevertheless, we still can't help but want to see what the world's new fastest gaming GPU can do. We look at the massive iChill GTX 780 Ti DHS HerculeZ X3 Ultra, a monster that costs £600.